As a private airport investor, we are conscious of our ecological and social obligations. Together with the airport companies, AviAlliance therefore actively acknowledges its responsibility towards the environment, local residents and employees. We consider it important to further the relationship between our airports and their neighborhoods in a spirit of partnership. After all, an airport's success cannot be measured solely by its business performance, it also depends on the acceptance of the people who live and work in it or close to it. For many years now, AviAlliance has been supporting social projects and educational establishments in the vicinity of the airports in which the company has stakes. In the past few years, we have made donations to charitable organizations, schools and kindergartens in Athens, Budapest, Düsseldorf, Hamburg and San Juan. Most recently, AviAlliance provided a donation to support the ecumenical airport chaplaincy at Düsseldorf Airport. The two full-time airport chaplains, who are supported by many volunteers, have a sympathetic ear for the concerns of passengers, visitors and employees at the airport. This pastoral care is an offer from the Protestant and Catholic churches in Düsseldorf and is aimed at anyone at the airport, whether religious or not. A further donation in 2018 was made to the “Friends of Old People” association in Hamburg. Within the framework of Hamburg Airport's Neighborhood Award, AviAlliance donated the Jury Prize, which was presented for the first time in 2018. Under the motto “Together instead of alone”, the association is committed to helping old people, mainly the very elderly, by providing visitors’ sponsorships. In this way, the association members help old and lonely people to overcome their isolation and regain joy in life. As well supporting people in the neighborhood of our airports, we attach great importance to sustainability. In all our activities, we take ecological aspects into consideration and support our airports in the planning, selection and application of environment-friendly technologies. This includes promoting the use of quieter aircraft and machinery in order to reduce noise nuisance on and around the airports. All the measures are geared to increasing mobility without neglecting the need to protect people, nature, water, air and cultural assets. Example Budapest Airport: An extensive energy and heating concept was developed to cater for more than 200 buildings, including terminals, heating plant and airfield lighting. In addition, as a voluntary measure, AviAlliance initiated a noise protection program there. Last but not least, four of the five airports in our portfolio are certified by the Airport Carbon Accreditation program, launched by ACI (Airports Council International), the only institutionally-endorsed carbon management certification standard specifically designed for airports. The program assesses the measures undertaken to improve the climate balance-sheet of airports. 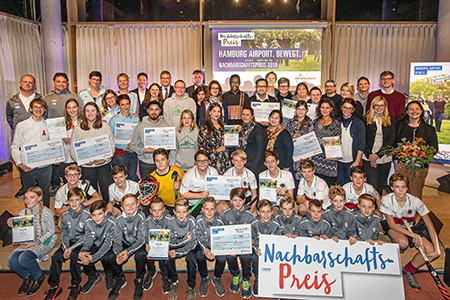 The winners of Hamburg Airport’s Neighborhood Award in 2018. The Jury Prize was donated by AviAlliance. 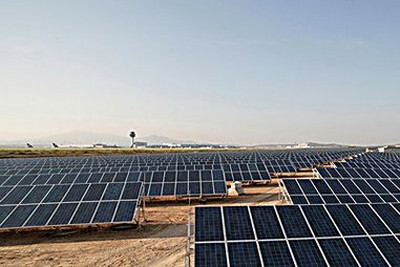 The photovoltaic park at Athens International Airport has an area of 160,000 square meters.